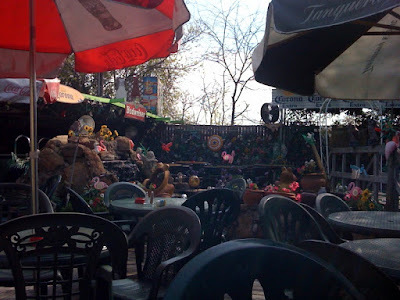 It's a little tacky with the fake flowers everywhere - but it's a great way to spend a beautiful day on the patio. It's interesting - it's a bar, it's a restaurant, it's a bakery - it's a gift shop - it's a garden store.. You pick! Our "bible book club aka bible study" met there this past Saturday. We had spinach dip and our favorite, Chunk Blue Chips - which are basically kettle chips with chunky blue cheese dressing and pico de gallo. They rock. We all ate salads so we could save room for dessert. They have every type of cake, cheesecake and pie to choose from. 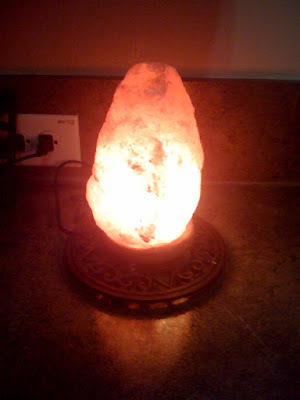 So if you check out the website - you'll see the advertisement for the Salt Lamp. allergies-asthma-attitude-arthritis-vision-sleep-sinusitis-pet odor-lethargy-learning-neuralgia-medicinal-toothache-depression-rheumatism-stop snoring-hypertension-chronic fatigue-blood pressure-migraines-respiratory problems. It's also an Air purifier.. right now I'm just using it as a night light on my kitchen counter. Stay tuned..I will let you know if my attitude improves. Right now, every time I look at it - it reminds me of an ORB or something out of a sci-fi movie. 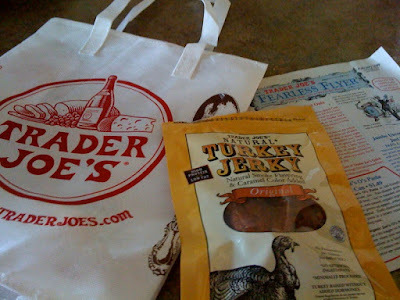 My new favorite... Turkey Jerky from Trader Joe's. I have never really liked "jerky" - but this stuff is GOOD!!! I got this for my birthday from my friend in California. I wish, wish, wish that we had one in Texas! She also sent me some 2 Buck Chuck - Chardonnay! Can't wait to try it!!! Some of my faithful fans may remember back in my early days of blogging, the story of pink scooter girl. Well, be on the look out. They are multiplying!!! Check out this photo. Even Aunt Janae has gotten the pink scooter fever! Check out this AWESOME cake Aunt Janae sent me for my birthday! 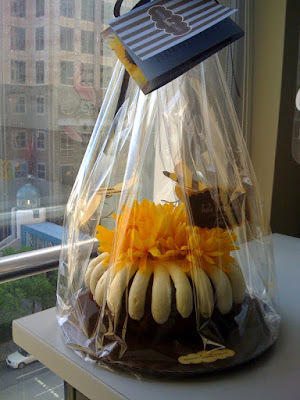 It's from a company called " NOTHING bundt CAKES"